Welcome to Dr. Dongsong Zhang's Home Page! Dr. Dongsong Zhang is a tenured Full Professor in the Department of Information Systems at the University of Maryland, Baltimore County. He received his Ph.D. in Management Information Systems from the Eller School of Management at the University of Arizona in 2002. He is the Graduate Program Director of Online MS in Information Systems. His current research interests include mobile HCI, social computing, health IT, business intelligence, and online communities. He has published approximately 140 research articles in journals and conference proceedings, including journals such as MIS Quarterly, Communications of the ACM (CACM), Journal of Management Information Systems (JMIS), ACM Transactions on Accessible Computing, IEEE Transactions on Knowledge and Data Engineering (TKDE), IEEE Transactions on Software Engineering, IEEE Transactions on Multimedia, IEEE Transactions on Systems, Man, and Cybernetics, IEEE Transactions on Human-Machine Systems, IEEE Transactions on Professional Communication, IEEE Intelligent Systems, Decision Support Systems, Information & Management, Journal of the American Society for Information Science and Technology, among others. He has received a dozen research grants and awards from U.S. National Science Foundation (NSF), National Institute of Health (NIH), U.S. Department of Education, Google Inc., National Natural Science Foundation of China, Chinese Academy of Sciences, the Royal Society of British, and UMBC, etc. According to Google Scholar, his work has been cited approximately 6,000 times. Please check more details about his research grants and publications. 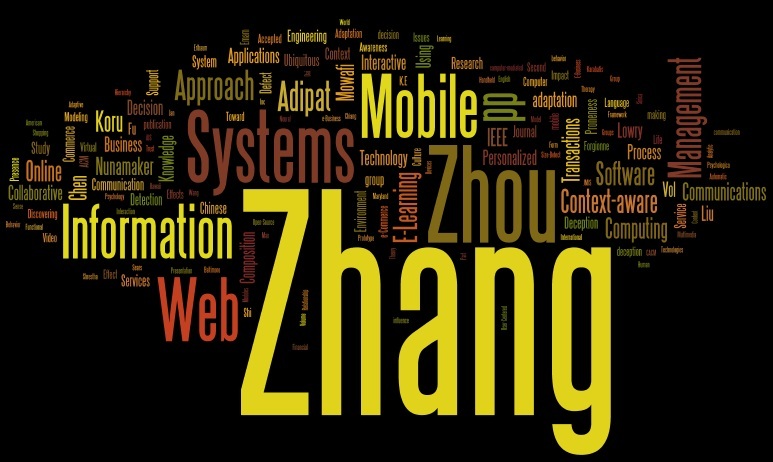 Prof. Dongsong Zhang is offering independent studies on mobile computing/applications and social media analysis for doctoral and master students in the academic year. Feel free to contact me if you are interested. Last modified Thursday, 16-Mar-2017 00:47:14 EDT.